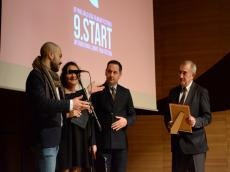 The 9th START International Festival of Short Films was held in Baku on November 14-17. The festival took place in the framework of the events held in accordance with the decree of Azerbaijani President Ilham Aliyev "On the 120th anniversary of the Azerbaijani cinema". Speaking at the ceremony, the festival director Fehruz Shamiyev noted that the festival featured a screening and competition of short (up to 35 minutes) films by young directors. About 490 short films from 45 countries were presented at the festival. The Organizing Committee admitted 100 films from 30 countries to take part in the contest, Trend Life reported. About 72 films (41 - feature films, 15 - documentaries, 11 - animation, 5 - experimental) were included in the international competition program and 28 films (17 feature films, 8 - documentary, 3 - animation) - in the national program. The works included in the international competition program of the festival were evaluated by members of the international jury consisting of five people - Ayaz Salayev (Azerbaijan), Gulbara Tolomushova (Kyrgyzstan), Cambuzia Partovi (Iran), Tobias Büchner (Germany) and Zahra Badalbeyli (Azerbaijan). Four films won the festival's main prize "Golden Pomegranate". The film "The Land" of Turkish director Onur Yagiza won in the nominations "Best Feature Film", "True Love" by Iranian director Iman Behruzi was named best in the nomination "Best Documentary Film", the film "Flooding" of German director Jonathan Schweng won in the nomination "Best Animated Film", while the film "The Land" of Turkish director Alijan Durbash won the nomination "Best Experimental Film". Five Azerbaijani films competed for the prize at the festival. "Son" directed by Parviz Gulmammadov became the winner in the nomination "Best Feature Film", "The Man" by Emin Ali won in the nomination "Best Documentary", the film "One Second," directed by Orkhan Adigozalov was named best in the nomination "Best Director", the film "Sonar" by Farid Kerimi got the prize in nomination "Best Screenplay", while the film "Memory" by director Elvin Ahmadoglu won in the nomination "Best Cameraman". The winners were awarded prizes. The festival was held by the Ministry of Culture, the Ministry of Youth and Sports, S?NEMA Young Filmmakers Center with the assistance of the Azerbaijan Youth Foundation, Producers Guild of Azerbaijan, Nizami Cinema Center and CinemaPlus.